Since 1975, the Amsterdam Marathon is held each year in the month of October. Interest in the marathon race hosted by the city of Amsterdam seems to be growing every year: the 2009 marathon, half marathon and 7.5 km races attracted a number of 26,000 participants, a record number of participants. Moreover, the Amsterdam Marathon is considered by the professionals at Runner's World among the best 10 marathons in the world. Like elsewhere, many Amsterdammers stand along the route to cheer the participants. 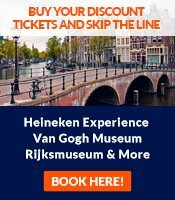 The race starts and finishes at the Olympic Stadium and leads through Amsterdam's old center, the Rijksmuseum (one of the most renowned museums in the world), Amsterdam's most popular park, the Vondelpark, and continues along the Amstel river. A large part of the race is run in the residential area and that makes for a unique and interesting itinerary. It's a flat and therefore fast surface. However, experience has shown that the results are substantially influenced by weather conditions. Taking part: Runners can sign up until a month before the race (or until the maximum number of participants set by the organizers is reached) via the marathon's official website. The costs for taking part in the full marathon are 55. Time limit: In 2001 the organizers introduced a 6 hours time limit for finishing the race that has remained unchanged until today. Accomodation: The Amsterdam Marathon offers participants the opportunity to book a hotel for their stay in Amsterdam. 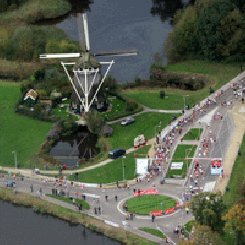 For more information please check the official marathon website www.amsterdammarathon.nl. While foreign athletes dominate the marathon statistics, it also attracts locals, not only as spectators but also as participants. Recently we had the chance to talk about the marathon with a Dutch friend, Amsterdam-born Maike who is very passionate about running. She ran this year's edition of the marathon. "Running the marathon was very important for me because running is my favorite sport and Amsterdam is my favorite city and also my city! In terms of an event, Amsterdam marathon should not be compared to much bigger events such as the New York Marathon, where there are hundreds of thousands of New Yorkers that support you all the way." "I feel that in Amsterdam, there are less people cheering on the sidelines but I hope that will improve in the future because it gives the race another dimension. However, the race has a charm of its own and for me the marathon in Amsterdam was like everything you truly love: you almost hate it at the same time! Totally worth it", says Maike. During the marathon, I ran a lot of kilometers with a guy from Italy. We didn't say a word, but he was next to me for a long time. When I passed the finish he was there waiting for me, hugged me and said: Brava!" The first marathon in Amsterdam was held during the 1928 Amsterdam Olympic Games, but no marathon races were organized during the next 47 years. Only in 1975 started the current series of annual marathons in Amsterdam. Due to the poor state of the Olympic stadium, the 1978 race was canceled. Moreover, for the successive years the start and finish were relocated to Dam Square. The year 1980 seems to be engraved forever in the memory of Dutch marathon fans, as this is the year when Dutch athlete Gerard Nijboer set a new Dutch record that stood for 23 years. Next, the start and finish moved to Museumplein. The year 1999 is considered a breakthrough year as several athletes obtained a time under 2.20.00 - a time which propelled the Amsterdam Marathon among the best 10 marathon cities in the world. Starting in 2001, the Olympic Stadium became once again the starting and finishing point of the race. In 2003 the Amsterdam marathon became the highest ranked marathon city of the Netherlands, surpassing Rotterdam, which up to then was the largest marathon in the country). The number of participants has grown steadily in the past years and each record seems to be broken by the following year's edition.